Mary was born to William and Catrina Pankow on October 9, 1929. She grew up on the family farm east of Olds and completed most of her education in town. In 1948, she moved to Calgary to complete her high school education at Mount Royal College. In 1949, she returned to Olds to work at the newly opened Bank of Nova Scotia as a teller. In the early 1950s, the Olds Associate Clinic opened and Mary went to work as a receptionist. This began a long career as both a receptionist and medical transcriptionist in Red Deer and Calgary. In 1996, Mary retired and moved back to Olds to be close to family. She filled her time with needle work, watching hockey and football, time at Gull Lake with dear friends and being a member of the Evergreen Centre in town. Mary was a big part of the family farm maintaining books and keeping the family fed during the busy seasons. Many hours where spent working alongside the Grandmas’ Pankow and Rindal. 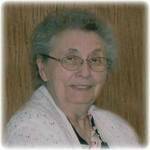 To send flowers to the family of Mary Marion Pankow, please visit our Heartfelt Sympathies Store.